To face climate change challenges and be collectively able to limit global warming under 2°C, innovation will be key. It will enable us to act simultaneously towards three major goals: reduction of greenhouse gas emissions, economic development and job creation, and energy security. These goals are at the heart of French energy transition for green growth act, which was passed in August 2015, a few months before COP 21 and the Paris Agreement. They are also developed in the national low carbon strategy published in November 2015. The main issue for emerging technologies and solutions is to go from the prototype stage to the market at a large scale. When new technologies manage to cross the “valley of death”, they are too often restricted to niche markets, usually because of high costs or risks. Although significant progress has been achieved in recent years, for instance in the field of renewable energy, which costs have fallen dramatically, investments are still short what is needed. Mission Innovation is about giving these new technologies and solutions the possibility to play a decisive role in the fight against climate change. The conjunction of public and private efforts at an unprecedented level must enable these revolutionary technologies to overcome barriers, accelerate their development and reach the mass market, to provide every country with reliable and affordable clean energy. In that context, France committed on November 30th2015, together with 19 other countries at the launch event of Mission Innovation, to doubling its state-directed public investments in research and development for clean energy over five years, compared to its average investment level during the 2012-2014 period (440 M€). A new round of the French programme of investments for the future was launched by the end of 2016, with a total amount of funding of 10 billion euros over 2017-2025. Around two thirds of this sum will be dedicated to the ecology and energy transition in general, including clean energy innovation in particular. France also published its national energy research strategy in December 2016, focusing on key transformational themes for energy transition (energy efficiency and integration of renewable sources, increased flexibility, digitization and decentralization of systems). It also emphasizes the need to support cross disciplinary research, to foster innovation in relation to territories and the industrial network, in particular small businesses, and to develop skills and knowledge for and through R&D. More information can be found at National Energy Research Strategy, December 2016. The energy issue is part of a complex framework that must address several major challenges: guaranteeing and securing access to energy for populations and organizations at an affordable and competitive cost, avoiding fuel poverty, tackling climate change mitigation and adaptation, preserving human health and the environment, and providing a sustainable energy mix. Through the Energy Transition Law for Green Growth and the ratification of the Paris Agreement, France is resolutely committed both to orienting technological and societal choices and to supporting a research and development (R&D) effort required for continuous improvement of existing energy sectors and the emergence of new solutions to meet these major challenges. First lessons learnt from demonstration projects have been shared and now is the time to scale up. Some pilot territories have been selected in 2016 to showcase the value of smart grids solutions and to experiment new technologies: project “Smile” in regions Britany and Pays de Loire, project “Flexgrid” in region PACA. Access to affordable fossil-free electricity for rural and urban households is a major challenge at the global level and is identified as one of the UN sustainable development goals. France is proud to co-lead this challenge with India and will host an international workshop in Paris in July 2017 in collaboration with the IEA, gathering researchers, companies, development banks, international institutions and NGOs, to help identify needs for innovation in this field. French players are active in the development of advanced biofuels, with several major demonstration projects ongoing for various categories of biofuels (bioethanol, biodiesel, algae biofuels…). These projects, associating research organizations and companies, will promote the development of industrial and commercial synergies between the advanced biofuels sector and the bioproducts sectors such as bio-alcohols, bio-olefins, bio-aromatics. Discovering new materials for clean energy is vital to enable a faster implementation of the energy transition. French research players are fully mobilized towards this goal and the French energy research alliance ANCRE has launched a multi-disciplinary dedicated work group on this topic at the beginning of 2017, in application of the French energy research strategy. French investments related to Mission Innovation will focus on renewable energy, energy storage, carbon capture storage and use, and innovations aiming at improving energy efficiency (including in industry, buildings, transports, circular economy, and smart grids). They will cover the whole chain of innovation, from basic research to demonstration (Technology Readiness Levels between 1 to 8 i.e. do not include deployment). Over the 2012-2014, the average state-directed public investments in these areas, both through research funding agencies programmes and public research organisations budget allocations, amounted to 440 M€ per year in France, as was reported to the International Energy Agency. This constitutes the baseline for France to be doubled by 2020. Beyond direct funding to R&D and innovation projects, France has also set up complementary instruments, such as a tax credit (“Crédit impôt recherche”), with 5.4 billion euros in 2016 to support companies’ efforts in R&D in all sectors, including in clean energy. France also contributes significantly to the European programme Horizon 2020 on clean energy, that amounts to 9.8 billion euros for the 2014-2020 seven-year period. The doubling effort in France will, for a large part, go through the Programme d’Investissements d’Avenir (PIA) or “Investments for the future programme”. A first round of this programme was launched in 2010, a second round in 2014 and a third round in 2017. French agency of environment and energy management (ADEME) operates in this framework a programme with about 4 billion euros funding on the 2010-2020 period (for subsidies, refundable grants, and also private equity in startups and SPVs for first-of-a-kind projects) and has launched a series of calls for projects of demonstration in the field of clean energy. So far, more than 620 projects have been supported with 2.1 bn€ from ADEME and a leverage effect (ratio of total cost to public funding) close to 3. The annual average spending by Ademe on this programme was around 125 M€ in 2015-2016, up 94% from the average annual level of 65 M€ during the 2012-2014 period. Several calls are opened at the beginning of June 2017 on various topics covering French perimeter for Mission Innovation and will help accelerating the funding of innovation in the coming months and years. Some calls are dedicated to small businesses, with a fast track and a simplified process. French agency of research (ANR) operates another PIA programme called “Instituts de la transition énergétique” (ITE) or “energy transition institutes”, with 1 billion euros funding on the 2010-2020 period. ITE gather private industries and public laboratories for the creation of new high standard companies dedicated to R&D and innovation in the field of clean energy: for instance, institute SUPERGRID is focused on future electric transmission grids, VEDECOM is specialized on sustainable mobility and connected vehicles, INES2 and IPVF are dedicated to solar energy, PIVERTand IFMASare focused on bio energy, EFFICACITY is about smart cities, etc. Decarbonisation of energy and chemistry sectors. 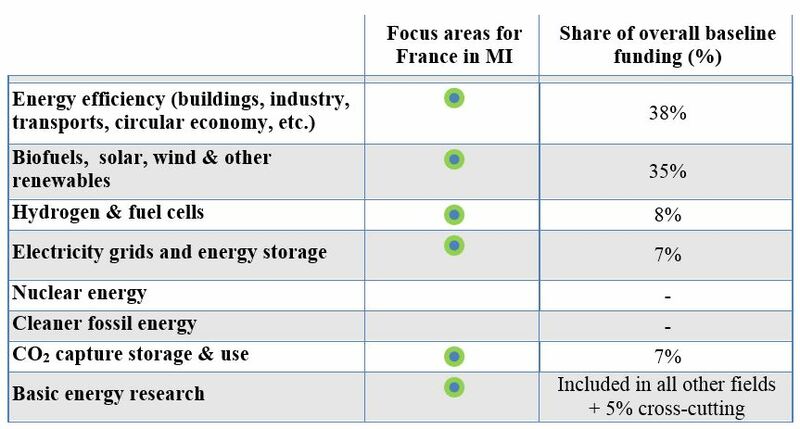 Main French energy research organisms (CEA, IFPEN, CNRS, universities, etc., that are grouped in a research alliance dedicated to energy, called ANCRE) also follow these priorities, through their objectives and performance contracts with the French State. Over 2012-2014, the average state-directed public investments in these areas, both through research funding agencies programmes and public research organisations budget allocations, amounted to 440 M€ per year in France, as was reported to the International Energy Agency. This constitutes the baseline for France to be doubled by 2020. Beyond direct funding to R&D and innovation projects, France has also set up complementary instruments, such as a tax credit (“Crédit impôt recherche”), with 5.5 billion euros in 2013 to support companies’ efforts in R&D in all sectors, including in clean energy. France also contributes significantly to the European programme Horizon 2020 on clean energy, that amounts to 9.8 billion euros for the 2014-2020 seven-year period. These investments will focus on renewable energy, energy storage, carbon capture storage and use, and innovations aiming at improving energy efficiency (including in industry, buildings, transports, circular economy, and smart grids). They will cover the whole chain of innovation, from basic research to demonstration. (Technology Readiness Levels between 1 to 8 i.e., do not include deployment).